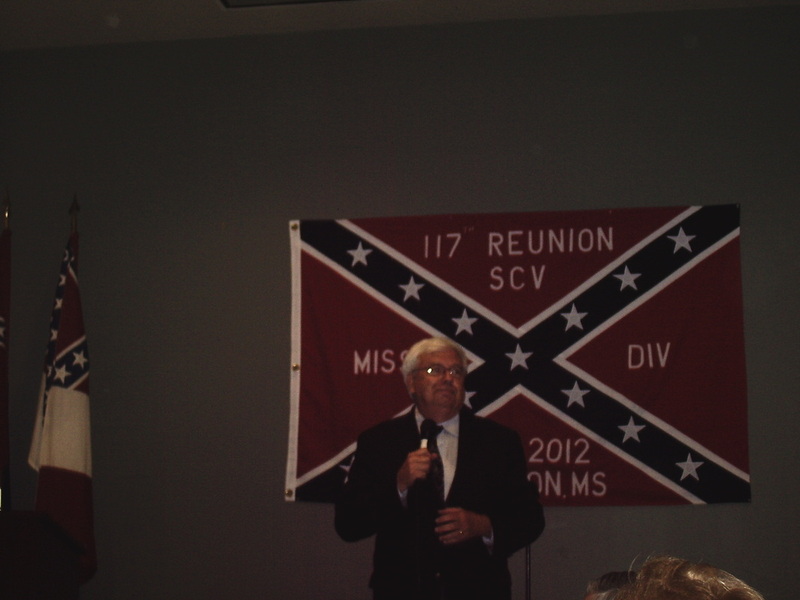 Camp Member Don Green attended the annual Balfour Christmas Ball at the Old Couthouse in Vicksburg, MS. on Dec. 8, 2012. Also in attendance were: Dan McCaskill and Andrew McCaskill of Camp #1625 in Indianola, MS. and Compatriot Charles Tucker from Jackson.MS. The ladies are Ann McCaskill, Miranda McCaskill, Alexandria McCaskill, Lucy McCaskill, and Suzi White. Compatriot Charlie Schmitz from the Picayune Camp #373 gave an interesting presentation on John A. Quitman at the 5th Brigade Christmas Party at the Dixie Community Center south of Hattiresburg, MS. on Friday December 7, 2012. Camp #227 members Don Green and Doug Jefcoat were in attendance. Camp Members Don Green, George Jaynes and Ronnie Mitchell are joined by Camp #1490 Purvis member Stacy Smith, Camp #1956 New Augusta member Hugh Draughn, Camp #1353 Hattiesburg member Sam Calvin, and Camp #1221 Meridan member Charles Mott of Enterprise for the Petal Christmas Parade on Saturday Afternoon December 1, 2012. Camp Members Doug Jefcoat, Andy Salassi, Cotton Norris, Don Green, George Jaynes, Sidney Parker, Reed Walters, Ronnie Mitchell and Joe Cosper form up as the 27th Miss. Honor Guard before the Laurel Christmas Parade on Saturday December 1, 2012. Also pictured are: Stacy Smith of Camp #1490 in Purvis, Dewayne Bryant's grandson Kane, and Pat Salassi. Not pictured is Compatriot Charles Mott of Camp #1221 of Meridian who's from Enterprise. Camp #227 members take a photo with Rebel Man, who is the mascot for Heidelberg Academy, at the Laurel Parade on Saturday December 1, 2012. Camp Member Don Green is joined by Camp #11 Semmes member Beetle Bailey, Camp #1956 Augusta Greys member Larry Higginbotham, Camp #1490 Purvis member Stacy Smith and his son Samuel as Federals at Landrum's on Saturday Nov. 24, 2012. Camp Members Billy Langley, Ronnie Mitchell, Reed Walters, Joe Copser, Carl Ford, and George Jaynes make up the 27th Miss. Inf. Co. B at Landrum's on Saturday Nov. 24, 2012. Not pictured are Doug Jefcoat, Sidney Parker, Coco Roberts and Cotton Norris. Also pictured is Compatriot Charles Tucker. 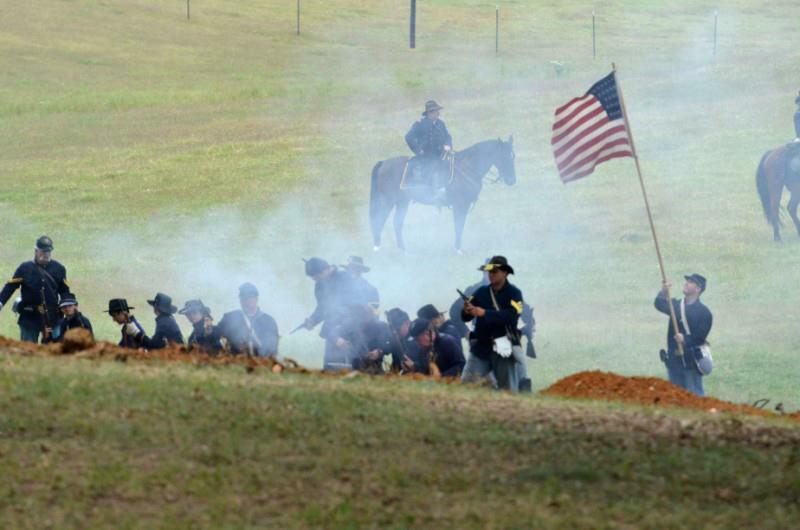 Camp Members Don Green and Andy Salassi fight as Federals at the Camp Moore Reenactment on November 18, 2012. 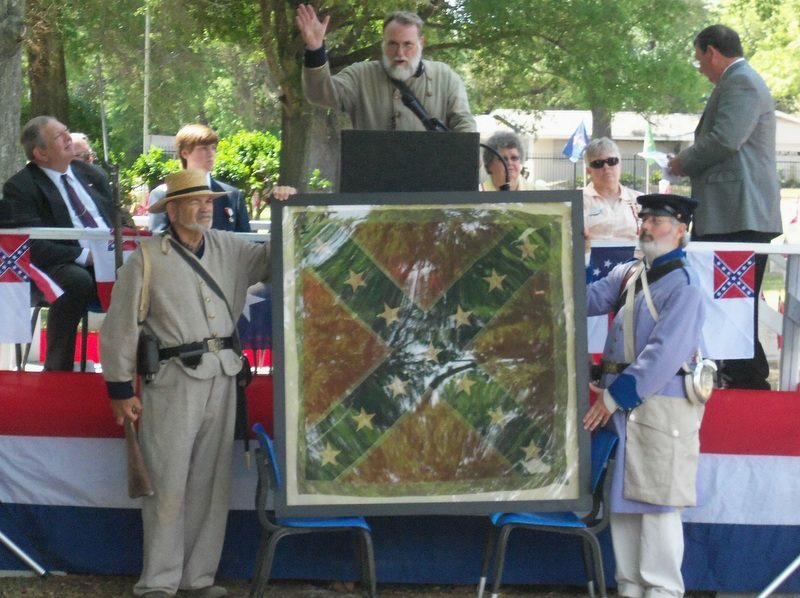 Camp Members Doug Jefcoat and Joe Cosper fight as Confederates at the Camp Moore Reenactment on November 17, 2012. 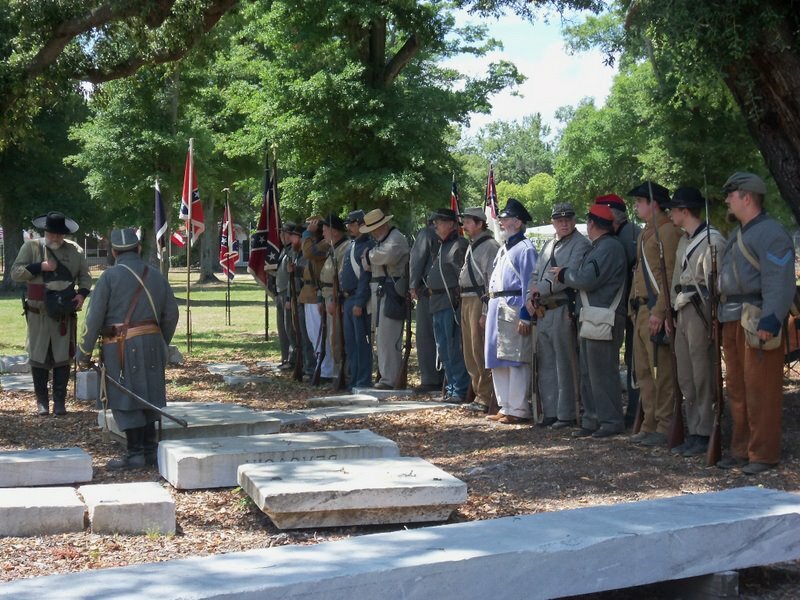 Camp member Don Green, Compatriot Jim Huffman of the Picayune Camp #373 and Compatriot Stacy Smith of the Purvis Camp #1490 participated in the Point Clear Memorial hosted by the Blakely Camp near Fairhope, AL. on Sunday Oct. 28, 2012. 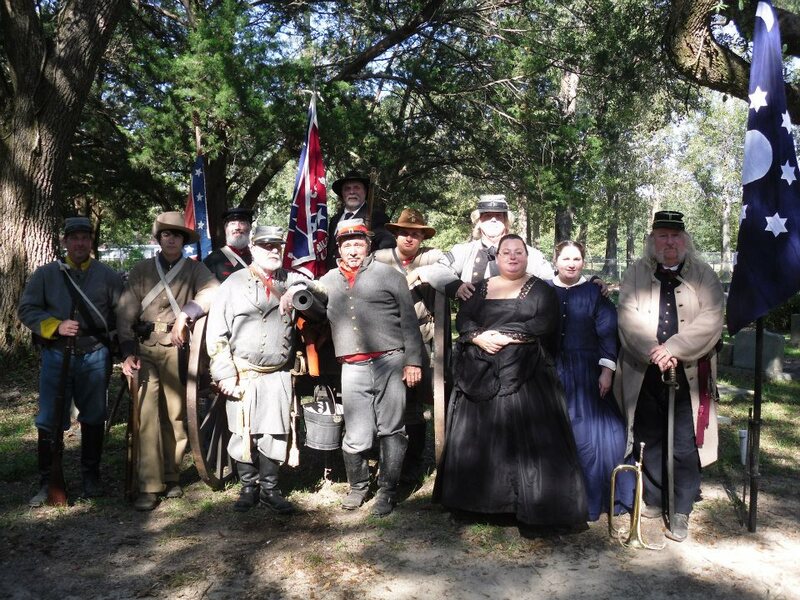 The Rosin Heels Camp set up a Confederate Encampment next to the Deason House on Saturday Oct. 27, 2012 in Ellisville, MS.
Camp members Don Green, Reed Walters, & Coco Roberts portrayed Newt Knight, Major Amos McLemore & Amos Deason during this year's annual Deason House Tour. Camp member Dennis Avera falls in with the 32nd Ala. Inf. in the photo on the left. Camp member Andy Salassi commands Wirt Adams Miss. Cav. in the center photo. 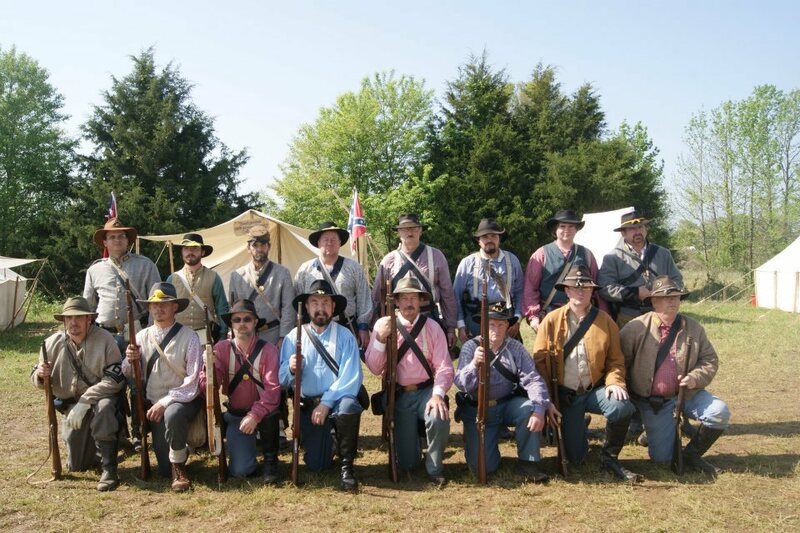 Members Don Green & Chris Robinson fall in with the 1st Ala Cav US in the photo on the right. 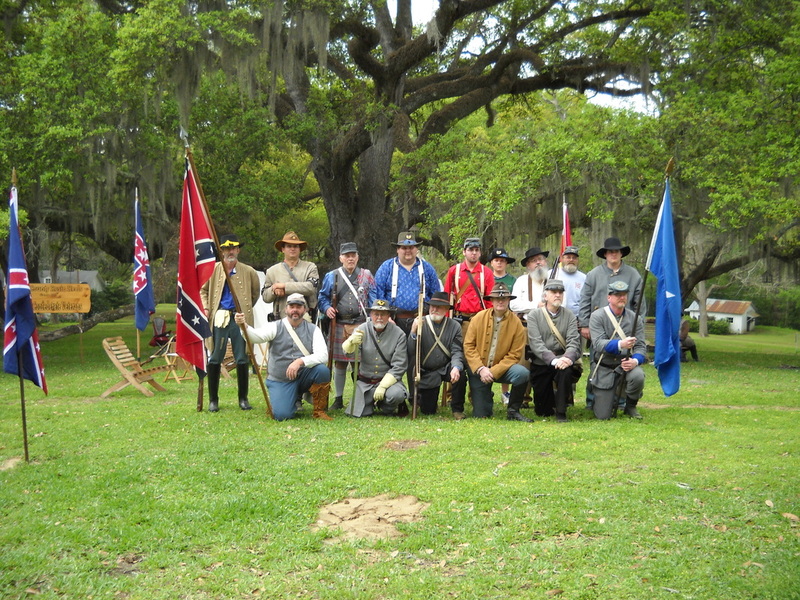 All participated at the annual Fall Muster Reenactment at Beauvoir held Oct. 19-21, 2012. 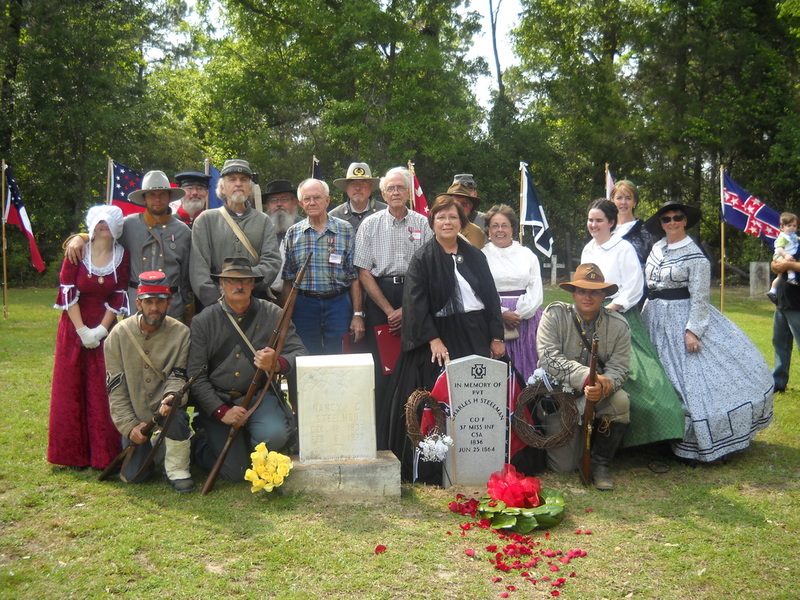 Camp #227 member Don Green participated in the McGowin Memorial near Andalusia, AL. with Compatriots Jim Huffman of Camp #373 and Stacy Smith of Camp #1490 on Sunday Oct. 14, 2012. Cpl. McGowin was in the unit Member Don Green's ancestor, Capt. W. B. Amos commanded. It was a special day for him. Camp Member Don Green went down to New Orleans, LA. with Compatriot Stacy Smith from Camp #1490 from the Purvis Chapter to participate in the 6th Annual Living History at Camp Parapet on Saturday October 6, 2012. The also visited Lee Circle, Confederate Memorial Hall, Fort Pike & Fort Macombe that day. Camp Member Don Green & Compatriot Jim Huffman of Camp #373 from Picayune, MS. made the journey to Magnolia Springs Baptist Church in Theodore, AL. to help Compatriot Terry W. "Beetle" Bailey & Camp #11 Raphael Semmes of Mobile, AL. to honor Pvt. James Madison Lundy, Sr. of Co. H, 15th Confederate Cavalry. The event took place on Sunday Sept. 23, 2012 and was well attended. Camp #227 had members participate in the 150th Anniversary Events at Farmington, MS Sept 14-16, 2012 in rememberance of the Battles of Farminton & Corinth, MS. In the photo above on the left, Camp members Joe Cosper, Reed Walters, Doug Jefcaot, Jake Jefcoat, Billy Langley, & Ronnie Mitchell fell in with the 46th Miss. Inf. for the weekend. 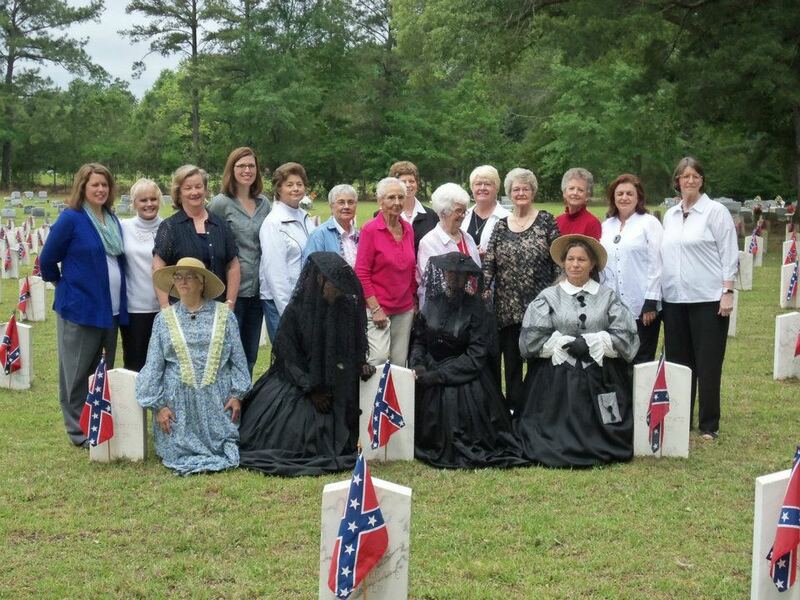 Camp member Don Green fell in with the 1st Ala Cav US Vols as seen in the photo above on the right. Camp member Sidney Parker fell in with Freeman's Artillery Battery & is not picutred. Camp #227 member Don Green helped with a weekend cleanup from Hurricane Isaac down at Fort Pike south of Slidell, LA on the Rigolets Pass on Sept 8-9, 2012. Pictured also are Stacy Smith & Darren Lucas, both of Camp #1490 7th Miss Inf Batt Camp from Purvis, MS. Also pictured is the State Archeologist for the LA State Parks Joe Yarbrough & his daughter. 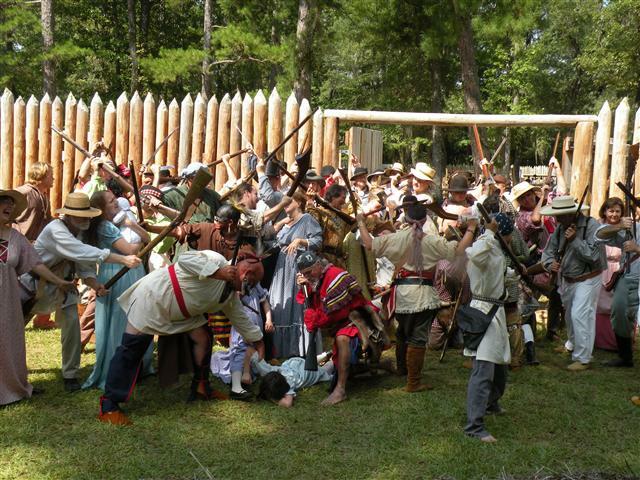 Camp Member Don Green participated in the annual Massacre at Fort Mims Reenactment near Stockton, AL. on Saturday August 25, 2012. The photo on the left is a group photo of all the participants. The photo on the right will be the 2013 Poster for the big 200th Anniversary Event set for next year. 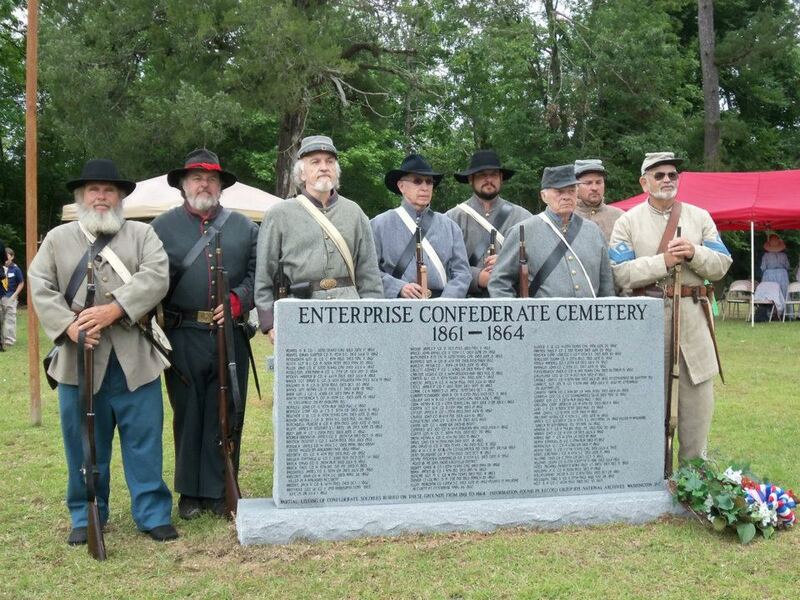 Camp Member Don Green participated with other Camps & Brigades for a memorial at Verona, MS. near Tupelo on Sunday August 12, 2012. Thanks to Compatriot Jim Huffman of Camp #373 for a ride to this special event. 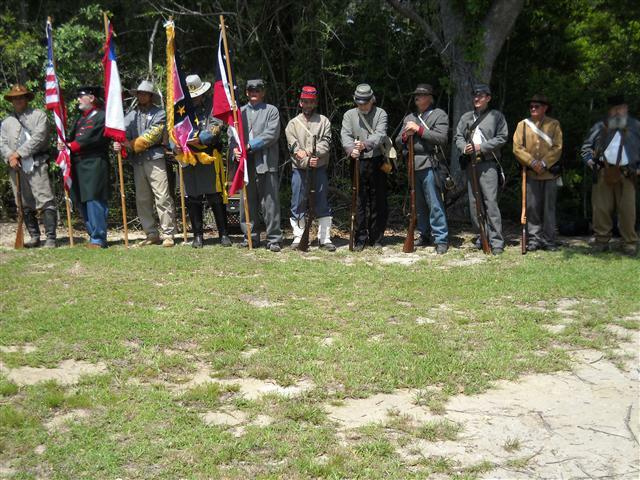 The Leakesville Camp #2215 signed & recieved their charter from Division Commander Alan Plamer at the annual Southern Heritage Conference on Saturday August 11, 2012 at Bethlehem Baptist Church near Laurel, MS.
Camp member Don Green participated in the Living History at Fort Morgan south of Gulf Shores, AL on Saturday August 4, 2012 for the Commemoration of the Battle of Mobile Bay. Camp #227 Members Don Green & Carl Ford represented the Rosin Heels at the annual National Reunion in Murfreesboro, TN. on July 13-14, 2012. Camp Members Don Green and George Jaynes present editor Mark Thornton with the A. J. Frants Media Award for the local newspaper for their coverage of the Camp. Don holds the Scrapbook Award given to the Camp this year. 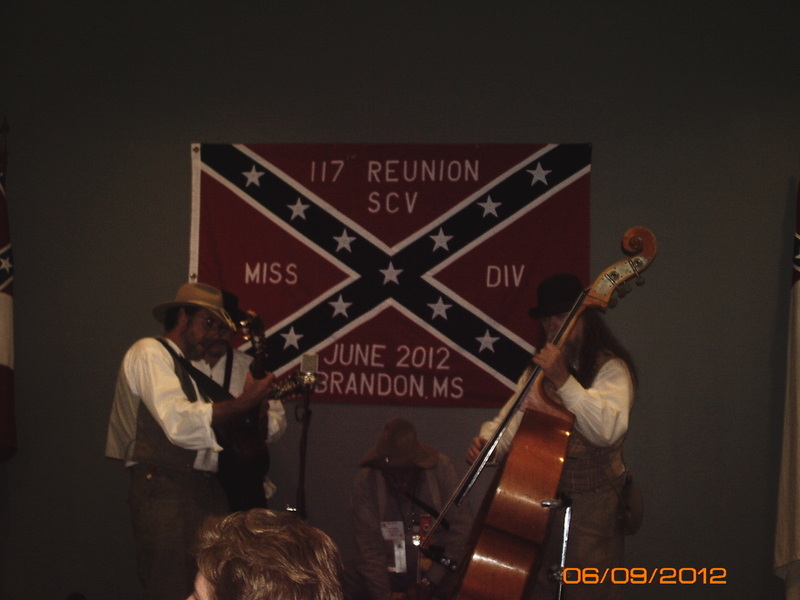 Camp Members Don Green & Carl Ford attended the Division Reunion in Brandon, MS June 8-10, 2012. The Lost Cause Band played on the left & Walt Grayson was the keynote speaker on the right. 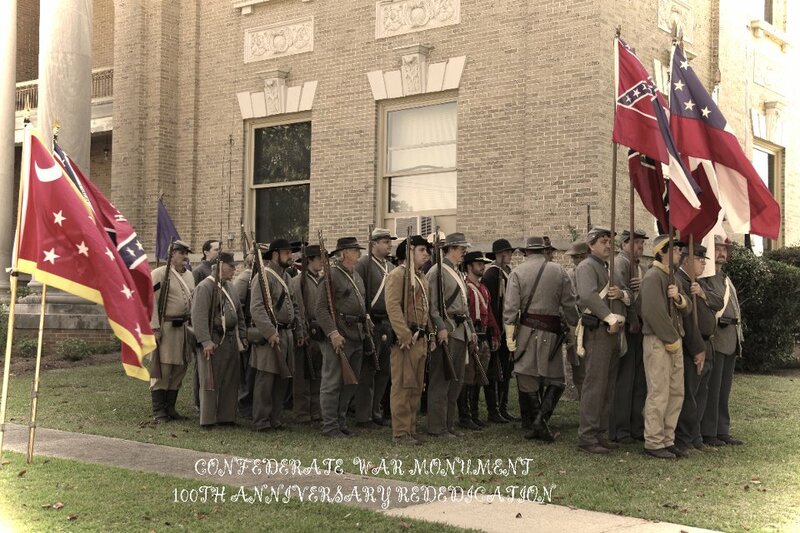 Camp #227 hosted the 100th year Rededication of the Ellisville Courthouse Statue on June 2, 2012. Camp Members make up the 27th Miss Honor/5th Brigade Honor Guard. Camp #227 paid for this sign on 16th Ave in Laurel, MS in Honor of President Jefferson Davis in June, 2012. Camp #227 members Joe Cosper and Dennis Avera participated in the Confederate Memorial Day Celebration at Beauvoir on Saturday April 28, 2012 in BiloxI, MS.
Camp #227 members Dennis Avera, George Jaynes, Ronnie Mitchell, Carl Ford and Joe Cosper helped to make up the 27th Miss Honor Guard at the Enterprise Confederate Cemetery Monument Dedication held on Saturday April 21, 2012 near Enterprise, MS.
Camp #227 member Don Green took part in the Brandon Memorial on Saturday April 14 at the Brandon City Cemetery. Camp #227 members Don Green, George Jaynes, and Coco Roberts participated in the Jake Alone Memorial that took place near Dixie on April 14, 2012. 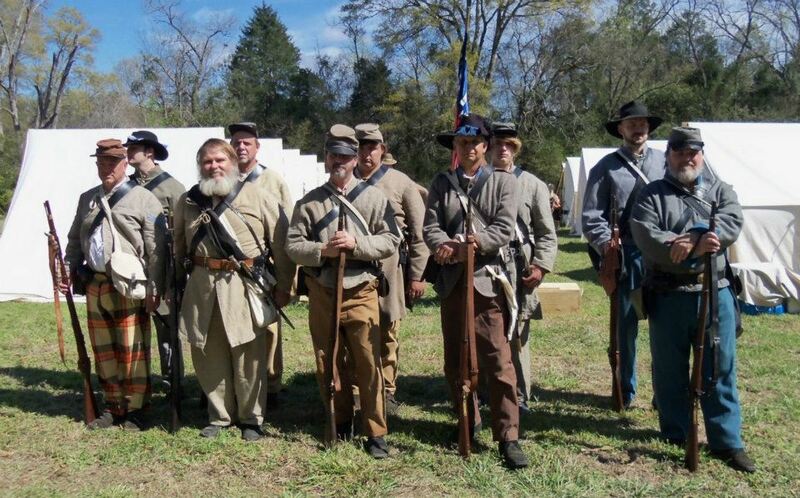 Camp #227 members Don Green, Chris Robinson & Andy Salassi fell in with the 4th Alabama Cavalry Co B at the 150th AOT Shiloh Reenactment. Members from Camp #373, #1490, & #590 also are in the photo above on the left. Pictured above on the right, Camp #227 members Doug Jefcoat, Joe Cosper, Billy Langley, Ronnie Mitchell, Andrew McCoy, and Dennis Avera attended the BGA Shiloh Event & fell in with the 46th Miss. Inf. 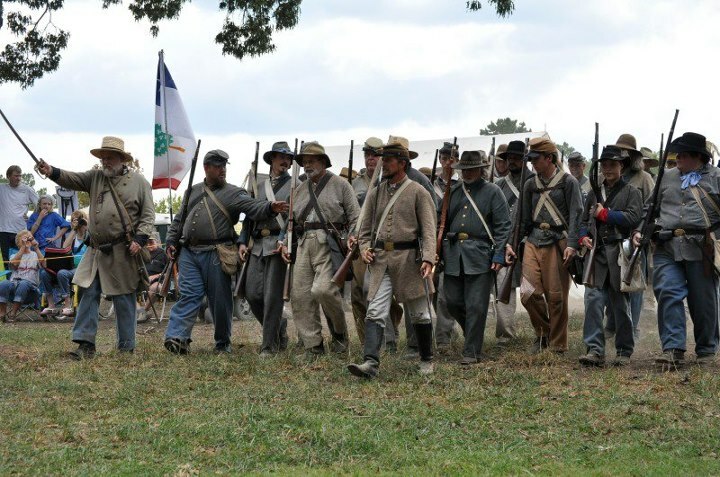 SCV Camp #227 combines with the Natchez Camp #590 and the Crystal Springs Camp #712 for a day of Confederate living history at historic Routhland Plantation in Natchez, MS. on Saturday March 17, 2012. Camp Member Dennis Avera falls in with the 31st Ala. Inf. at Gainesville, AL. on March 10, 2012. Camp Members Don Green & Chris Robinson fall in with the 1st Ala Cav Co B as Federals at Gainesville, AL. on March 10, 2012. Camp #227 Members Joe Cosper, Ronnie Mitchell, Doug Jefcoat, Dennis Avera and Billy Langley reenact with the 46th Miss. Inf. at Quitman on Feb. 25, 2012. Camp #227 Members Don Green & Chris Robinson reenact with the 1st Ala. Cav. Co. B. US Vols at Quitman on Feb. 25, 2012. Camp #227 Members make up the 27th Miss/5th Brigade Honor Guard at the Laurel Lee-Jackson Banquet at Bethlehem Baptist Church near Laurel, MS. on January 28, 2012. Camp #227 member Don Green participated with members of the Lucedale Camp #1748, Picayune Camp #373, & Semmes Camp #11 to clean the Salem Cemetery at the Greene/George County Line of off Hwy 57 on DeSoto National Forest Property on Saturday January 21.